Some people spend all Thanksgiving day in the kitchen, working hard to prepare the turkey, multiple side dishes, and desserts for their friends and family. And while those people are heroes, if you’re reading this, you’re probably a little lazier than those people. Those hard-working folks have stopped reading at this point, so it’s just us and we can speak freely. Ok, why do they spend so much time cooking when there’s so much bourbon to drink and football to watch? It’s the wrong way to spend Thanksgiving! But even us lazy people sometimes have to throw together something for Thanksgiving, and Trader Joe’s is the perfect place to help with that. Sure, they have all the basics like turkey and stuffing for folks who want to season their food with elbow grease, but they also have inventive, delicious food that makes it look like you spent a ton of time in the kitchen! Here are the best entrees, sides, and desserts to buy at Trader Joe’s to help you cheat at Thanksgiving. 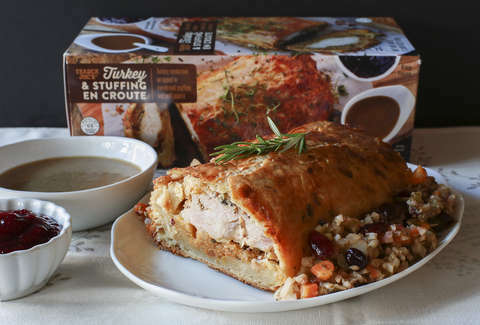 You can find an uncooked, organic, free-range turkey from TJ’s for $3.49 a pound. But preparing a turkey takes a little bit of elbow grease and following these safety rules from the CDC so everyone at Thanksgiving doesn’t end up sick. Instead, how about buying this pre-made, puff-pastry wrapped bird with sweet cornbread stuffing? The most difficult aspect of preparing it is remembering to thaw it in the fridge 24 hours prior to Thanksgiving. It feeds eight people for just $12.99, which is McDonald’s value meal-type pricing for something way more high-end. Trader Joe’s even knows what this dish is all about -- the sign underneath this item at my local store reads: “Tell Everyone You Made It -- Impress Your Pals!”. Color us impressed. If people see cranberry sauce on the table in the shape of a can, they’ll assume that’s where you got it from. But does pre-prepared cranberry sauce ever come with Valencia oranges? No. You’ve fooled them again. You have gotten one over on everyone at the table. You are now both King and Queen of Thanksgiving now and forever. Don’t you dare serve turkey gravy from a box. Because if you’re going to cheat, cheat with some good stuff! Head to the refrigerated aisle for this Kettle Cooked Turkey Gravy, which differs from the boxed version because it’s made with a roux. If you don’t know what roux is, you’ve clearly never been a French chef. It’s ok, us either. Roux will save your gravy from being watery and gross, and it’s also a fun word to say. Another fun fact: roux is pronounced like Rue (McClanahan), who played Blanche on Golden Girls. And now we’ve also given you something to talk about around the table that isn’t politics or religion. This is one of the more boring names for a side dishes we’ve ever encountered, but don’t judge the Trader Joe’s side dish by its name. It’s white and yellow corn baked in a corn puree with Mozzarella and Parmesan cheeses, and if there’s a dish with corn and cheese in it that doesn’t taste good, I haven’t had it. But the best part for all you lazy bums out there is that it takes three-and-a-half minutes max in the microwave to prepare. You’ll be back to watching the Falcons/Saints game in no time. A newcomer to the selection of TJ’s Thanksgiving sides in the frozen section, this gratin is heavy on the broccoli and cauliflower (50% of the dish, according to TJ’s!) along with Mozzarella and Grana Padano cheese. It feeds four people for the startingly low price of $3.99, but considering the presence of a ton of delicious cheese in the dish, we’re going to guess this feeds you and absolutely no one else. We recommend placing the side dish right next to your plate so your family can’t tell if it’s one of your plates or if you’re supposed to be passing it around. Not every side you serve needs to have cheese in it. Especially not a potato dish, though you could serve TJ’s cheesy spuds Scalloped Potatoes Quattro Formaggio, you little cheater! Making sweet potatoes is super easy in a microwave, but who wants to spend time mashing potatoes afterwards? Especially when your hands are cramped from all that holidaytime Instagram scrolling. Trader Joe’s makes it easy with this mass of mashed sweet potatoes with butter and cinnamon, along with a bit of crunch from the maple roasted nuts. It’s $4.99, takes three minutes to get on the table, and gives you more time to do what’s really important over the holidays: judge everyone else’s Thanksgiving spreads on social media. Yeah, you can get top-notch pumpkin and apple pie with a lattice crust from TJ’s at reasonable prices ($5.99 and $6.99, respectively), and you should! And if you serve one pie that’s clearly store-bought, you might be able to convince everyone you actually made one dessert yourself! The other key to cheating is buying a dessert that’s so unique it could’ve only come from your kitchen. Or Trader Joe’s. That’s why you need to buy the cream cheese frosting-laden chai spice loaf for dessert. The frosting is where all the fun happens atop this pumpkin cake, as it’s filled with chai spices like cinnamon, clove, nutmeg, cinnamon, and black pepper.